WILLEMSTAD - They still have water, but it is only the question whether the prisoners in the Curaçao prison will get to eat bread today. 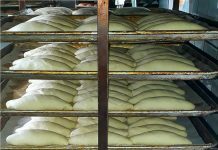 The bakery delivering 1500 fresh bread every day turns out to be illegal. That became apparent after a raid at the wholesale company Hector Henriquez, which is located at the old Caracasbaaiweg (Caracas Bay Road). The Inspectorate of the Ministry of Economic Development was inspecting for expired products and found an illegal bakery there. It was closed immediately. Food items were also found that were indeed past their date. A batch of shrimps with a shelf-life of November 2011, pita bread with an expiration date of July 2013, and more. Hector Henriquez came earlier in the news because of 22,000 kilos of expired meat found by the inspectors.